Heritage Pac. Fin. v. Monroy, 2013 Cal. App. HERITAGE PACIFIC FINANCIAL, LLC, Plaintiff, Cross-defendant, and Appellant, v. MARIBEL MONROY, Defendant, Cross-complainant, and Respondent. Contra Costa County Super. Ct. No. C10-01607. Judges: Lambden, J.; Kline, P.J., Richman, J. concurred. Maribel Monroy executed two promissory notes with WMC Mortgage Corp. (WMC) when purchasing a home in Richmond, California in 2006 (the Richmond property). After a foreclosure on the senior deed of trust, Heritage Pacific Financial, LLC (Heritage) acquired Monroy’s second promissory note from WMC. Heritage sent Monroy a letter attached to a complaint and summons advising her that Heritage had filed a lawsuit against her alleging various fraud claims. The letter admonished that any misinformation provided by Monroy on her original loan application with WMC could result in civil liability and that Heritage would proceed with a lawsuit if it were unable to resolve the matter with Monroy. Monroy filed a cross-complaint against Heritage, alleging violations of the Rosenthal Fair Debt Collection Practices Act (Rosenthal Act) and the federal Fair Debt Collection Practices Act (FDCPA or the Act). After permitting Heritage to amend its complaint three times, the trial court sustained Monroy’s demurrer against Heritage’s pleading on the grounds that Heritage had failed to provide or allege an  assignment agreement with sufficient particularity to demonstrate that the assignment of Monroy’s promissory note included an intent to assign WMC’s tort claims against the borrower. Thereafter, Monroy moved for summary judgment or adjudication on her cross-complaint. The court denied her motion as to her claim of a violation of the Rosenthal Act but granted the motion as to a violation of the FDCPA, on the condition that Monroy agree to damages in the amount of one dollar. Monroy agreed to the damage award of one dollar and the court entered judgment in her favor. Subsequently, Monroy requested attorney fees and costs under title15 of the United States Code section 1692k(a)(3), and the court found that Monroy was the prevailing party and entitled to attorney fees and costs in the amount of $89,489.60. The court concluded that the issues regarding the cross-complaint and complaint were interrelated and could not be reasonably separated. Heritage separately appealed the judgment and the award of attorney fees and we, on our own motion, consolidated the appeals. On appeal, Heritage argues that it sufficiently set forth allegations to support a claim that the assignment from WMC included  an intent to assign WMC’s tort claims against Monroy and that the trial court improperly weighed the evidence when sustaining the demurrer without leave to amend. It also contends that triable issues of fact exist regarding Monroy’s FDCPA claim and therefore the trial court erred in granting summary judgment. Finally, it objects to the award and amount of attorney fees. We are not persuaded by Heritage’s argument, and affirm the judgment and the award of attorney fees. Monroy is Spanish speaking and works as a housekeeper. On November 26, 2006, she purchased the Richmond property for $425,000. Monroy executed two promissory notes with WMC. She obtained a senior mortgage loan for $340,000 and a junior mortgage loan for $85,000 (the note, the second note, or the promissory note). Both promissory notes were secured by a deed of trust on the property. The beneficiary of each deed of trust was Mortgage Electronic Servicing Corporation. On her loan application, Monroy claimed to make $9,200 per month as the owner of Maribel’s Cleaning Services. Monroy signed a certification that she did not have a family or business relationship with the seller of the property. The seller of the Richmond property was Marvin E. Monroy, Monroy’s son. He received $53,258.49 as a result of the sale. Monroy bought the house from her son because he was not able to make the mortgage payments. At this same time, on November 20, 2006, property in Manteca (the Manteca property) was purchased in Monroy’s name and a promissory note was executed for the amount of $312,000. According to Monroy, the Manteca property was purchased under her name as a result of identity theft. She stated that in 2006 she was unaware of this transaction. She averred that she has never been to the Manteca Property. In 2008, Monroy submitted to the credit-reporting agency a verified fraud  statement. In this statement, she asserted that a mortgage in Manteca was opened in her name as a result of the identity theft. Monroy failed to make her mortgage payments on the Richmond property, which resulted in a foreclosure on the senior deed of trust on August 28, 2008. On May 22, 2009, Heritage acquired Monroy’s second promissory note as part of a “larger pool of loans.” Heritage is a limited liability company organized under the laws of the State of Texas and its principal place of business is in Dallas County, Texas. Heritage sent Monroy a letter stating that it had purchased her second unpaid loan. Heritage was unsuccessful in speaking with Monroy. In October 2009, Heritage sent by certified mail another notice of the transfer of the ownership of the note. Heritage sent Monroy a third notice in December 2009. In this notice, it asserted that she was obligated to pay Heritage the unpaid balance on the second promissory note. Heritage did further research and concluded that Monroy had misrepresented her income and submitted false documentation regarding her income on her original loan application. Heritage also discovered that Monroy’s son was the seller of the Richmond property. Additionally, it uncovered the documents related to the Manteca property. On June 1, 2010, Heritage filed a complaint against Monroy for intentional misrepresentation, fraudulent concealment, promise without intent to perform, and negligent misrepresentation based on her loan application with WMC. Heritage alleged that it was not barred from pursuing its action by any antideficiency statute because it was not seeking a deficiency judgment for the balance of a promissory note following foreclosure, but was seeking a judgment for Monroy’s alleged fraud in connection with her loan application. Heritage requested actual damages in the amount of $85,000, the sum owed on the promissory note, and also asked for punitive damages. On July 28, 2010, Monroy answered Heritage’s complaint and filed a cross-complaint alleging violations of the Rosenthal  Act (Civ. Code, § 1788 et seq.) and the FDCPA (15 U.S.C. § 1692 et seq.). A little more than a month later, on September 2, Heritage demurred to the cross-complaint and filed a motion to strike the pleading. On November 16, 2010, Monroy filed a motion for judgment on the pleadings on Heritage’s complaint. Heritage  filed its first amended complaint for the same four causes of action on December 23, 2010. Heritage attached Monroy’s second promissory note for $85,000, and alleged in the pleading that the assignment was recorded on the last page of the promissory note. The SAC also added the following language: “The assignment of the tort claim is also implied by conduct of the parties in the secondary mortgage market as it is custom and practice in the mortgage industry to assign any and all rights and interests including any right to tort claim against the borrower when selling mortgage loan. [Heritage] alleges that based on the conduct of the parties and the language included  in the buy sell agreement of the loan, and the custom and practice of lenders such as WMC, the assignment of [Monroy’s] loan by WMC included assignment of any and all tort claims.” The SAC also asserted that the language of the loan application signed by Monroy implied the assignment of tort claims. On November 18, 2011, Monroy filed a motion for summary judgment or summary adjudication on her cross-complaint. Monroy asserted that Heritage was involved in the business practice of filing invalid fraud claims to avoid California’s antideficiency laws in order to collect on nonrecourse  debts or convert them into recourse default judgments. With regard to the claim of violating the FDCPA, Monroy alleged that Heritage was a debt collector and was engaged in a deceptive debt collections practice within the meaning of title 15, United States Code sections1692d, 1692e, and 1692f. Monroy cited the letter Heritage sent her after it had filed the lawsuit against her. Monroy also asserted that Heritage had violated provisions of the Rosenthal Act underCivil Code sections 1788.17and1788.13, subdivision (k). Monroy claimed that she was entitled to $1,000 for Heritage’s violation of the FDCPA and $1,000 for Heritage’s violation of the Rosenthal Act. Heritage opposed the motion for summary judgment and also requested a continuance to conduct additional discovery. In its opposition to Monroy’s motion for summary judgment, Heritage agreed that it was a debt collector but disputed the contention that the FDCPA applied. Heritage argued that the FDCPA did not apply because Monroy bought the Richmond property for her son and also purchased a home in Manteca. It also disputed the allegation that it engaged in deceptive debt collections practices within the meaning of the FDCPA or  that it violated the Rosenthal Act. The trial court denied Monroy’s summary adjudication motion with regard to her claim that Heritage violated the Rosenthal Act. The court concluded there was  a triable issue of fact as to Heritage’s statutory “unclean hands” defense. The court also sustained a number of Heritage’s objections to the declaration of Monroy’s counsel. The trial court denied Heritage’s request for a continuance to conduct additional discovery. Heritage’s four discovery motions were set for a hearing 10 days after the scheduled trial date and thus the court found that Heritage’s discovery requests were untimely. Further, the court found that there was no good cause for granting a continuance. Heritage filed a timely notice of appeal. On March 23, 2012, Monroy filed a memorandum of costs. On May 10, 2012, Monroy filed her motion for attorney fees and costs under title15 of the United States Code section 1692k(a)(3). Heritage filed its memorandum in opposition on June 6, 2012. On July 10, 2012, the court filed its order granting Monroy’s motion for an award of attorney fees and expenses. 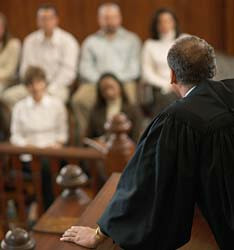 The order stated that Monroy was the prevailing party and entitled “to the full amount of her attorney’s fees relating to the FDCPA claim as well as to Heritage’s complaint.” The court added: “The issues are synonymous and interrelated and cannot reasonably be separated.” The court concluded that counsel’s hourly fee rate of $450 was “within acceptable parameters for attorneys of [counsel’s] skill and experience practicing” in the San Francisco Bay area, and that the time spent was 194.5 hours. The court denied the enhancement requested. The court awarded fees in the amount of $87,525 ($450 x 194.5). The court awarded litigation expenses in the amount of $1,964.60. On this same date, July 10, 2102, the trial court entered an amended judgment, stating that  it had sustained with prejudice Monroy’s demurrer to Heritage’s SAC, and had granted Monroy’s motion for summary adjudication on her claim in her cross-complaint for violations of the FDCPA. The court repeated that Monroy shall take statutory damages of one dollar on her cross-complaint, the maximum she could receive without a trial. The court stated that Monroy was the prevailing party and awarded her $89,489.60 for attorney fees and litigation costs and expenses ($87,525 + $1,964.60). Thus, the total judgment in favor of Monroy and against Heritage was $89,490.60 ($89,489.60 + $1.00 in damages). Heritage filed a timely notice of appeal from the order awarding attorney fees. This court on its own motion consolidated both of Heritage’s appeals. On November 8, 2012, Monroy filed a request for judicial notice of an order in a class certification lawsuit against Heritage and of Heritage’s requests for default judgments against other plaintiffs in a different lawsuit. Heritage opposed the request and argued that Monroy is asking this court to take judicial notice of facts in documents and these facts may not be true. On December 5, 2012, we issued an order that the opposed request for judicial  notice would be decided with the merits of the appeal. “‘Taking judicial notice of a document is not the same as accepting the truth of its contents or accepting a particular interpretation of its meaning.’ [Citation. ]While courts take judicial notice of public records, they do not take notice of the truth of matters stated therein. [Citation.] ‘When judicial notice is taken of a document, . . . the truthfulness and proper interpretation of the document are disputable.’ [Citation. ]” (Herrera v. Deutsche Bank National Trust Co.(2011) 196 Cal.App.4th 1366, 1375. )Accordingly, we take judicial notice of the existence of these court documents (Evid. Code, §§ 452, subd. (d),459, subd. (a)), but do not take notice of the disputed facts in the documents. Heritage argues that it adequately alleged that WMC assigned its fraud claims against Monroy to it. The trial court’s insistence that it had to attach a document establishing the assignment shows, according to Heritage, that the court improperly considered the sufficiency of the evidence when ruling on the demurrer. For the reasons discussed below, we disagree with Heritage’s contention. Heritage cites various allegations in its SAC where it asserted in a conclusory fashion that WMC assigned to Heritage its tort claims when WMC transferred to Heritage its rights under Monroy’s promissory note. In particular it cites its allegations that WMC “sold the loan and assigned any and all rights WMC may have including but not limited to any right to fraud claim” against Monroy. It further alleged that this assignment was “evidenced by signature and stamp of the secretary of WMC” on the  last page of the note. Heritage set forth in its SAC that as the assignee of WMC, Heritage “obtained all rights, title and interest in and to the mortgage loan by defendant[,]” including WMC’s tort claim. Heritage claimed that the assignment of tort claims was implied by the following language in the agreement between Heritage and WMC: “‘Seller does hereby sell, assign and convey to Buyer, its successors and assigns, all right, title and interest in the loan.’ The loan sell agreement also provided that ‘the Seller transfers assign, set-over, quitclaim and convey to Buyer all rights, title and interest of the Seller in the mortgage loan. '” The SAC added that WMC acknowledged on May 9, 2011, that it assigned to Heritage its tort claims. Heritage insists that the foregoing language and the attached document, which was the written indorsement  containing the signature and stamp of the secretary of WMC on the last page of the promissory note, were sufficient, and the trial court should have overruled Monroy’s demurrer. Additionally,  the allegations did not show an assignment of the tort claims based on custom and practice. “While no particular form of assignment is necessary, the assignment, to be effectual, must be a manifestation to another person by the owner of the right indicating his intention to transfer, without further action or manifestation of intention, the right to such other person, or to a third person.[Citation. ]” (Cockerell v. Title Ins. & Trust Co., supra,42 Cal.2d at p. 291. )The parties’ intention is determined by considering their words and acts as well as the subject matter of the contract. (Lumsden v. Roth(1955) 138 Cal.App.2d 172, 175. )The assignment agreement in the present case is completely silent regarding any tort claim and nothing in the agreement suggests that the assignment included any rights other than those rights incidental to the contract rights. Heritage cannot allege general custom and practice to expand the assignment agreement to include ancillary rights not specified. Applying the legal principles set forth inNational Reserveto the present case, Heritage has failed to state a claim for a cause of action for fraud based on Monroy’s loan application. Neither the indorsement nor the other allegations in the SAC authorize the assignment, specifically or impliedly, of WMC’s tort claims. As already stressed, fraud is an ancillary cause of action to the promissory note. Heritage maintains that it did not have to allege details and could simply allege a clear statement of the ultimate facts necessary to the cause of action. (SeeLyon v. Master Holding Corp.(1942) 50 Cal.App.2d 238, 241.) Heritage claims that it was sufficient for it to plead the ultimate fact of ownership of the property at the time it filed this action and cites a 1924 case,Commercial Credit Co. v. Peak(1924) 195 Cal. 27, 32-33.This case does not help Heritage.Commercial Creditinvolved recovering the value of personal property or chattel. (Id.at p. 29. )This case did not involve a promissory note; it did not involve a claim based on the assignment of a tort; nor did it involve claims based on fraud. Thus,Commercial Credithas no application to the present case. Heritage ignores that every element of a fraud cause of action must be pleaded specifically. Finally, Heritage complains that the trial court was assessing the veracity of the allegations in the SAC, and cites the court’s order instructing it to attach a writing to show an assignment as proof that the court improperly assessed the weight of the evidence. We disagree with Heritage’s conclusion. “A written contract may be pleaded either by its terms––set out verbatim in the complaint or a copy of the contract attached to the complaint and incorporated therein by reference––or by its legal effect.[Citation.] In order to plead a contract  by its legal effect, plaintiff must ‘allege the substance of its relevant terms. This is more difficult, for it requires a careful analysis of the instrument, comprehensiveness in statement, and avoidance of legal conclusions.’ [Citation. ]” (McKell v. Washington Mutual, Inc.(2006) 142 Cal.App.4th 1457, 1489. )Since the allegations in Heritage’s pleadings did not set forth with specificity any assignment of the tort claims, the trial court properly instructed Heritage to attach the written agreement that evinced an intent to assign the tort claims. Heritage contends that the trial court abused its discretion when it did not permit it to amend its SAC. Taylor’s declaration on August 24, 2011, more than two years after Heritage acquired Monroy’s unpaid note as part of a “larger pool of loans,” does not shed any light on the parties’ intent at the time of the assignment. The assignment agreement contains absolutely no language indicating that WMC intended to transfer any rights ancillary to the right to collect on the promissory note. Contract “rights” do not exist as disembodied abstractions apart from a contract that created them. More precisely, in California, “the intention of the  parties as expressed in the contract is the source of contractual rights and duties.” (Pacific Gas & E. Co. v. G.W. Thomas Drayage etc. Co.(1968) 69 Cal.2d 33, 38.) Thus, we assess the intent at the time the agreement is formed, not years later. The trial court provided Heritage with ample opportunity to cure the defect in its pleading; Heritage failed to demonstrate it could cure the defect. The trial court thus did not abuse its discretion in sustaining the third demurrer against Heritage’s pleading without leave to amend. Monroy alleged violations of the Rosenthal Act and the FDCPA in her cross-complaint. She claimed that Heritage violated the FDCPA by attempting to collect a debt not owed, by using unconscionable, false, deceptive, and/or misleading means to seek to collect a debt, and by threatening legal actions that could not be legally taken. Under the FDCPA, “A debt collector may not use any false, deceptive, or misleading representation or means in connection with the collection of any debt.” (15 U.S.C. § 1692e.) A violation of this section includes “[t]hefalse representation of” “the character, amount, or legal status of any debt[. ]” (15 U.S.C. § 1692e(2)(A).) A violation also includes “[t]hethreat to take any action that cannot legally be taken . . . .” (15 U.S.C. § 1692e(5).) Additionally, a violation occurs if the debt collector uses “any false representation or deceptive means to collect or attempt to collect any debt or to obtain information concerning a consumer” (15 U.S.C. § 1692e(10)) or makes “[t]hefalse representation or implication that accounts have been turned over to innocent purchasers for value” (15 U.S.C. § 1692e(12)). Monroy’s claim was based on the collection letter dated May 25, 2010, sent to her by Heritage. She received the letter on June 28, 2010, and it was attached to the summons and complaint against her. The letter advised that Heritage had commenced a civil action against Monroy and admonished her that “any misinformation or misrepresentations provided in the [loan] application are a violation of federal  law and may result in ‘civil liability, including monetary damages, to any person who may suffer any loss due to reliance upon any misrepresentation’ for which Heritage . . . currently seeks.” The letter warned that if Heritage was unable to resolve the matter by the date Monroy’s answer was due, Heritage would “have no other option but to proceed with litigation against” her. The letter declared that it was “from a debt collector” and was “an attempt to collect a debt.” In the trial court, in Heritage’s separate statement of disputed facts in support of its opposition to Monroy’s motion for summary adjudication, Heritage admitted that it was a debt collector and that it was attempting to collect an alleged debt against Monroy. Thus, the undisputed facts established that Heritage was a debt collector and attempting to collect a debt from Monroy. Monroy’s obligation was to pay for “personal, family, or household purposes” (15 U.S.C. § 1692a(5)), as this was a debt incurred to purchase a home in which, according to Monroy’s declaration, she intended to live. There was evidence that a Manteca property was also purchased in Monroy’s name, but there is no evidence that she ever lived in  that home or intended to live in that home. Indeed, the unchallenged evidence was that Monroy was the victim of identity theft and that she did not know anything about the Manteca property. Monroy stated that she lived at the Richmond property and Heritage presented no evidence that she resided at another location. The evidence also supported a finding that the letter Heritage sent to Monroy violated the FDCPA. The letter attached to the complaint and summons threatened Monroy with a lawsuit for any misinformation she provided on her loan application with WMC. Heritage asserted that Monroy owed it the money for any fraud on her application because it was now the owner of the promissory note. As discussed extensively above, Heritage’s claims based on fraud had no merit. Thus, Heritage violated the FDCPA when it indicated in the letter that it had the right to sue Monroy for any misinformation submitted on the promissory note and when it attempted to induce her to settle with Heritage. Additionally, according to Ben Ganter, the director of client relations for Heritage, Heritage acquired Monroy’s unpaid note as part of a larger pool of loans that included both secured and unsecured mortgage  loans. He acknowledged that Heritage then “seeks to collect on the unpaid balances of the notes it purchased” and that “Heritage’s business model is collecting on the loans it purchases.” Heritage purchased Monroy’s junior loan without any knowledge about the accuracy of the loan application. Before Heritage discovered the alleged fraud, it sent Monroy letters telling her that she was obligated to pay Heritage “for the unpaid balance of the note . . . .” According to Ganter, a third notice of Monroy’s obligation to pay [Heritage] for the unpaid balance on the Note was sent via postal mail in December of 2009. These notices clearly violated the FDCPA because, as the trial court found, Heritage had made a binding judicial admission that it received the assignment of Monroy’s note after the foreclosure of the first deed of trust, and that event extinguished the second deed of trust securing Monroy’s note under the antideficiency statutes (seeCode Civ. Proc., § 580b). Heritage also argues that “debt,” as defined by the FDCPA, does not include tort claims. As already noted, Heritage also violated the FDCPA when it sent a notice demanding payment on the money owed on the promissory note when that debt had been extinguished under the antideficiency statutes. Furthermore, we disagree with Heritage’s argument that tort claims are never debts under the FDCPA. As already stressed, a debt or obligation under the FDCPA must be based on a consumer consensual or contractual arrangement, not a damage obligation. (See, e.g.,Hawthorne v. Mac Adjustment, Inc., supra,140 F.3d at p. 1372). Unlike the cases upon which Heritage relies, the present case is not a situation in which Monroy never had a contractual arrangement of any kind with WMC. Rather, Monroy’s alleged debt to Heritage arose out of her transaction with WMC to purchase the Richmond property.The alleged fraud claims clearly arose out of a residential mortgage transaction and Heritage cannot avoid the application of the FDCPA simply because it alleged in its pleading that Monroy’s obligation to it was based on the misrepresentations she made on her loan application rather than on a breach of her obligations under the contract. InTurner v. Cook, supra,362 F.3d 1219, the liability arose from tortious activity, not from a consensual transaction. By contrast, here, Monroy and WMC entered into a consensual loan agreement for the purchase of a  residential home. Heritage argues that the present liability did not arise out of a consensual transaction because WMC did not consent to mortgage fraud. Heritage maintains that the present transaction is the same as the theft of goods or services. Here, WMC and Monroy consented to the loan application. The fraud action, even though it is a tort claim, arose from the consensual loan transaction, and thus it is a debt under the FDCPA. Heritage contends that it has a defense, as a matter of law, to the application of the FDCPA. It claims that it relied on an advisory opinion by the Federal Trade Commission (FTC) that collecting on tort damages is not a debt for purposes of the FDCPA. This letter is an “informal staff opinion” and not an advisory opinion. Furthermore, the claim of damages arising from a theft, as was the subject of the FTC’s letter, is clearly distinguishable from the present case. As already discussed, Heritage was not collecting on tort damages, but on a claim of fraud arising out of a loan contract. Courts held as early as 1998 that there is no automatic fraud exception to the FDCPA. (Keele v. Wexler, supra,149 F.3d at p. 595[“neither the text nor underlying legislative history of the FDCPA lends itself to the recognition of a fraud exception”].) Heritage’s ignorance of the law does not provide it with an affirmative  defense to the application of the FDCPA. Heritage argues that the trial court should not have granted the summary adjudication motion because there was a triable issue of fact as to whether the tort claims had been assigned. It complains that the court refused to consider its evidence of assignment. Here, the undisputed facts establish that Monroy’s loans were covered by the antideficiency statutes and that the junior loan was assigned to Heritage after the foreclosure on the senior loan. Thus, there was no triable issue of fact that Heritage could seek payment for breach of the promissory note. Furthermore, as already discussed, Heritage has failed to identify any evidence that raised a triable issue of material fact as to its argument that the assignment agreement included WMC’s potential tort claims against Monroy. Accordingly, we conclude the trial court  did not err in granting Monroy’s motion for summary adjudication on her claim that Heritage violated the FDCPA. The trial court found that Monroy was the prevailing party and entitled to attorney fees under the FDCPA. (15 U.S.C. § 1692k(a)(3).) The court awarded Monroy attorney fees in the amount of $450 an hour for 194.5 hours for the lodestar amount of $87,525. The court also awarded Monroy litigation expenses in the amount of 1,964.60. “Unless authorized by either statute or agreement, attorney’s fees ordinarily are not recoverable as costs. [Citations. ]” (Reynolds Metals Co. v. Alperson(1979) 25 Cal.3d 124, 127-128. )The FDCPA provides for attorney fees to be awarded to the prevailing party. (15 U.S.C. § 1692k(a)(3).) “Courts have discretion in calculating reasonable attorney’s fees under this statute” (Jerman, supra,599 U.S. at p.[130 S.Ct. at p. 1621]), but the award of at least some modicum of attorney’s fees is mandatory under the FDCPA when the defendant is found to have violated the Act because “congress chose a ‘private attorney general’ approach to assume enforcement of the FDCPA” (Camacho v. Bridgeport Financial, Inc.(9th Cir. 2008) 523 F.3d 973, 978). Heritage contends that the trial court did not apply the proper standard of law, and then argues that the attorney fee award was excessive because the trial court did not reduce the award on the basis that Monroy’s success was limited. The  decision whether to reduce an award because of a determination that the party enjoyed limited success is not reviewed de novo, as Heritage argues, but for an abuse of discretion. Here, Heritage argues that Monroy’s attorney fees are unreasonably large in comparison to Monroy’s recovery of $1.00. It also maintains that Monroy admitted at her deposition that she did not know what the case was about and, thus, according to Heritage, she had no stake in this action. Heritage complains that the trial court failed to take into consideration the limited amount of success achieved and asserts that its violation of the FDCPA was only a technicality as Monroy could not show any damages. Under the FDCPA, the court in awarding damages is to consider “the frequency and persistence of noncompliance by the debt collector, the nature of such noncompliance, and the extent to which such noncompliance was intentional . . . .” (15 U.S.C. § 1692k(b)(1).) Here, the trial court recognized that Heritage wrote a number of letters to Monroy that violated the FDCPA. The court considered that Monroy did not seek to add unnecessary legal fees by insisting on litigating the damages. It also considered that she did not initiate the lawsuit against Heritage, but filed a counterclaim in response to Heritage’s attempts to force her to pay money that she did not owe. Lastly, while the award here was nominal, that is not necessarily controlling because “an award of nominal damages can represent a victory in the sense of vindicating rights even though no actual damages are proved.” (Farrar v. Hobby, supra,506 U.S. at p. 121, O’Connor, J., concurring.) Success may be measured by “the significance of the legal issues on which the plaintiff prevailed and  the public purpose the litigation served.” (Morales v. City of San Rafael(9th Cir. 1996) 96 F.3d 359, 365.) This lawsuit may spur Heritage to cease unlawful conduct against other consumers, which is an important consideration. We thus conclude that the trial court did not abuse its discretion in not reducing the attorney fee award based on an argument that Monroy achieved limited success. Heritage objects to the amount of the fee charged by Peter B. Fredman, counsel for Monroy, and asserts that the calculation included hours for work not reasonably expended in pursuit of Monroy’s successful claim. (See, e.g.,Harman v. City and County of San Francisco(2007) 158 Cal.App.4th 407, 424[appellate court determined trial court properly deleted hours spent on unsuccessful petition for rehearing of a prior appeal].) Specifically, Heritage objects to the following: 2.4 hours spent by Fredman on March 25, 2011, for attending to a letter from Heritage that threatened Fredman with a libel suit; .06 of an hour spent on April 21 and 22, 2011, for drafting a declaration in support of a motion in a different superior court class action lawsuit where Heritage was a party;  9.6 hours for attending to matters regarding the class action case and/or conferring with class counsel; 7.9 hours for communicating with another attorney regarding a demurrer hearing;5.02 of an hour on May 31, 2011, for reviewing investigation material of a defendant in another case involving Heritage; .08 of an hour on July 25, 2011, for a conference with another person involving Heritage in Bankruptcy Court; and 3.2 hours for an appearance at a summary judgment hearing when Fredman missed the hearing but made an appearance later to deliver a proposed order.Heritage claims that awarding fees for the foregoing, which equals 23.26 hours, was an abuse of discretion. At the hearing on attorney fees, counsel for Heritage made a number of specific complaints about the reasonableness of the hours billed. For example, Heritage argued that Fredman billed his client .6 hours for preparing a declaration for another action; Heritage also objected to billing  for work allegedly done on other cases unrelated to the present action. The trial court responded that it did not see “any of this in any of your papers.” Counsel for Heritage answered that it was in its opposition. The court commented that it would have to take another look, but instructed counsel to proceed with argument. At the end of the hearing, the court affirmed its tentative ruling. Heritage maintains that the court made its ruling without reviewing its papers as promised and therefore it clearly abused its discretion. The record indicates that the trial court reasonably exercised its discretion in determining the number of hours spent on the lawsuit. The trial court considered Heritage’s argument that the abovementioned charges were unreasonable. The court listened to argument and obviously concluded that the argument by Heritage’s counsel lacked merit and that it was unnecessary to read through the opposition papers again to determine if each specific objection had actually been raised in Heritage’s opposition. Heritage contends that the hourly rate of $450, which the trial court awarded Fredman, was unreasonable. Here, Fredman declared that he had 15 years of experience and his “old” hourly rate was $450 per hour. (He declared that his rate had increased to $500-$525 per hour.) He noted that this rate had been approved for his work in a class action settlement in the superior courts and federal court. He added that this hourly rate did not include a contingency risk. Fredman also attached the declaration of Attorney Richard Pearl. Pearl summarized the hourly rates charged by various law firms for comparable services. According to his analysis, fees awarded in class actions cases in 2012, for 12-15 years of experience, varied from $455 to $610 per hour. We  do not find Heritage’s argument to be persuasive. The attorney fees awarded inNavarro,a 2007 federal case where the legal work was completed in 2006, have little relevance to the hourly rate of fees for legal work done in 2010 through 2012. Monroy’s counsel submitted evidence supporting his hourly rate and Heritage did not submit evidence of current rates contradicting this rate. Accordingly, we conclude that the trial court did not abuse its discretion when it used the hourly rate of $450. Heritage asserts that the trial court should have reduced the amount of the attorney fees requested because Fredman used block billing. In support of this argument, Heritage states that Fredman submitted records demonstrating that he billed 182.6 hours in this litigation. Heritage fails to provide any citation to the record to support this statement. Heritage complains in a conclusory fashion that Fredman assigned a block of time to multiple tasks rather than itemizing the time spent on each task. It asserts that the use of block billing makes it impossible to discern the amount of time spent on each task. In support of this argument, Heritage relies onBell v. Vista United School Dist. (2000) 82 Cal.App.4th 672.6  InBell,the court reversed an attorney fee award because the block billing made it impossible for the court to apportion the fees between a cause of action alleging a Brown Act violation for which statutory fees are allowed and other causes of action. (Id.at p. 689. )Browndoes not suggest that block billing is never appropriate. Trial courts retain discretion to penalize block billing when the practice prevents them from discerning which tasks are compensable and which are not. (Christian Research Institute v. Alnor(2008) 165 Cal.App.4th 1315, 1324-1325;Bell v. Vista Unified School Dist., supra,82 Cal.App.4th at p. 689.) The trial court identified  no such problem here, and Heritage has completely failed to show that block billing occurred or that 182.6 hours billed for litigation was unreasonable. Heritage argues that the trial court erred when it awarded attorney fees associated with the litigation in defense of the tort claims against Monroy because no statute or contract provided for fees in defense of these claims. In a separate argument, it asserts that the court should also have separated the fees associated with Monroy’s unsuccessful claim of a violation of the Rosenthal Act. In attacking the fees awarded, Heritage in its opening brief does not even mention the trial court’s ruling that the issues raised by Heritage’s complaint and Monroy’s counter claims for violating the Rosenthal Act and the FDCPA “are synonymous and interrelated and cannot reasonably be separated.” Noticeably absent from Heritage’s briefs in this court is any discussion of the substantial authority supporting a trial court’s decision not to apportion fees when all of the claims are interrelated. The record supports the trial court’s conclusion that Heritage’s fraud claims based on WMC’s assignment of the promissory note and Monroy’s counter claims that Heritage violated the Rosenthal Act and FDCPA were interrelated. The facts and issues related to Heritage’s claims and Monroy’s counter claims were almost identical, as they both related to the question whether Heritage had a legal right to collect money from Monroy. We agree with the trial court’s finding that Heritage’s causes of action were closely interrelated with Monroy’s counter claims. We conclude that nothing in the record indicates  that the trial judge, who presided over the entire case, abused her discretion in calculating the award of attorney fees. The judgment and the order awarding attorney fees are affirmed. Heritage is to pay the costs of both appeals. March 2013 California real estate sales – the sum of distressed and non-distressed property sales – fell 12.9 percent year-over-year. Some of the decline this year is likely due to the roving Easter holiday that landed on March 31 this year and April 8 last year. Over a longer time period, however, Q1 2013 sales are still at their lowest since 2008. In addition to an overall downturn in sales, the mix of properties for sale in March changed markedly. When sales are divided into distressed and non-distressed sales, non-distressed sales increased to 62.9 percent of total sales in March 2013, up from 48.8 percent and 50.8 percent in January and February 2013, respectively. Since January 2012 of 65.5 percent, distressed property sales as a percent of total sales gradually declined to 48.8 percent in February 2013. While still a large portion of the market and nearly four times the pre-housing crisis average, distressed property sales in March 2013 saw a sharp decline to 37.1 percent of total sales. REO resales declined from 24.5 percent of total sales in February, to 13.8 percent of total sales in March. The decline in bank REO resales is perplexing and we are conducting further research to determine the root cause. When it comes to buying a home, the average buyer is at the mercy of what is available on the market. Typical buyers do not have access to REO portfolios or early knowledge of short sales that will turn out to be screaming deals. The current market is one where inventory is scarce like water in Death Valley but access to debt is plentiful. The amount of all cash buyers has been a big factor as well driving up prices on what little good inventory is out there. California also recently enacted the Homeowners Bill of Rights which will slow down an already slow foreclosure process. Because of this, foreclosure starts in California are down to levels last seen in 2005 when the market was raging in a furious mania. We are seeing a very different market today being driven by a low interest rate environment and an insatiable investor appetite. Let us first look at the impact of the Homeowners Bill of Rights. This is the lowest level of foreclosure starts since 2005. The process has already been slowed since banks have figured out that there is more profit in holding inventory off the market then actually putting it out for sale. Keep in mind that very little of this is helping your average American homeowner. Even here in California, I get e-mails from couples being out-bid on properties by all cash investors courtesy of the low rate easy money environment. I’m also noticing the level of credit card offers I’ve been receiving over the last year is nearly on par to what it was in 2005 and 2006. Money (debt) is cheap if you can get your hands on it but the problem is you are competing against billions of dollars of hot money flowing out of Wall Street and foreign hands into targeted markets. With such little inventory, this external pressure has turned the market into a feeding frenzy. The difference between the peak inventory in 2008 at 3.5 million and our low at nearly 1.7 to 1.8 million is 1.7 or 1.8 million properties (essentially what is sitting in the distressed pipeline). But what you are seeing especially in certain niche markets is that most of the inventory has disappeared. We are seeing annual declines of 50, 60, or 70 percent. “(USA Today) WASHINGTON — Personal income growth plunged 3.6% in January, the biggest one-month drop in 20 years, the Commerce Department said Friday. And consumer spending rose just 0.2% with most of it going toward higher heating bills and filling up the gas tank. 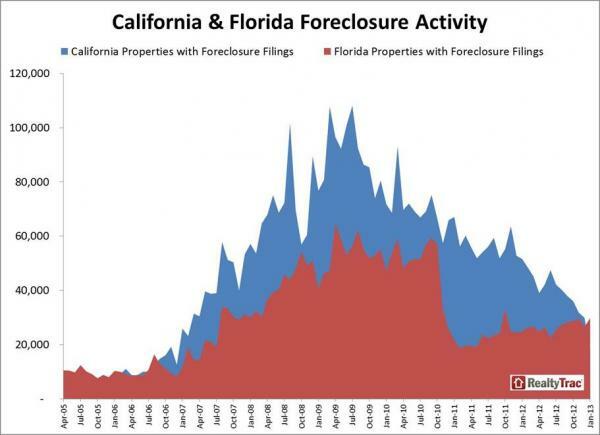 Florida has once again regained the title of having the most foreclosure activity on a raw number basis even with less people than California. A big part of this of course is coming from the new legislation enacted in California which ironically, is going to be another reason on the growing list of items as to why California inventory is so incredibly low. 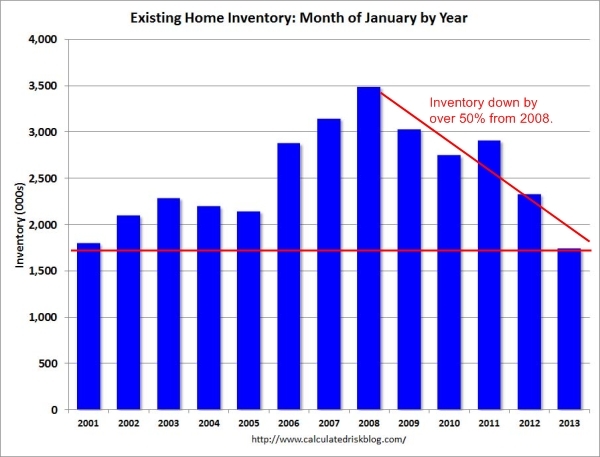 I have seen some reports showing that inventory is picking up nationwide but this doesn’t seem to be the case in California, at least not yet. For example, 2 years ago Pasadena had 489 listings while today it is down to 216 (a drop of 56 percent). Culver City went from 124 2 years ago to 26 today (79 percent drop) according to Movoto market trends. This trend is obviously unsupportable. If we keep heading in this direction there will be zero homes for sale come the end of the year. Welcome to the unintended consequences of massive market intervention. Republicans: be careful what you wish for. A brewing White House scandal could ruin Obama AND the Republican Party. I believe a similar dynamic is occurring here in Portland, albeit on a much smaller scale. The legislature passed a similar bill a few months ago, and most of the RE agents have no inventory to show prospective buyers – what a weird market that kind of law tends to create. Seeing the same thing here on the oregon coast, one thing i have noted is that many houses on the listing show no furniture in them. As a buyer of real estate i have never seen the % so high. These houses are not REO, but have no furniture, leaving me to question what’s going on. Many realtors are fixing up friends and relatives, by telling buyers like myself that the house is already sold when in fact it hasn’t been. Thus keeping offers off the market. This has happened to us several times, only to find that the house sold a few months later for less than we would have offered. Even realtors tell me of this also. Same thing happening to me here in LA. Saw a property in Eagle Rock go down in price from 300′s to 240K (!!) and could not get an offer in while willing to pay in 300′s…and just last week another short sale that got listed only to get a full mailbox and no return calls from realtor. I put in an offer immediately and was told it was pending while listed 200K below surrounding home prices. I will be watching as it goes through and will probably start filing FBI reports. This is BS. The “Bills of Rights” above has 2 elements, the slowing foreclosure activity I’ve seen (occupancy field rep) hasn’t been due to the consumer protection provisions, many which actually help servicers too due to the clear, defined legal processes. I have seen plenty of homes that are in distress and abandon (including PDX which I visited last weekend) that would be marketable but for chain-of-title issues. As states and courts (like the above CA $7500 fine for filing unverified foreclosure documents, or in OR where MERS can’t be used for a non-judicial foreclosure) have clamped down it has become too risky and expensive for servicers to “recreate” proper title unless debtors co-operate in short sales or deed-in-lieu. Example: debtor dies and is deeply underwater with their mortgage, servicer doesn’t have clear chain-of-title due to securitization/MERS, heirs don’t want the property and don’t co-operate, so the house is sitting vacant and rotting. Stalemate. This is one of purposes behind the Federal Reserves’ MBS purchases, i.e. QE3, of $40 billion per month. If the real estate market where healthy there would be no reason to do QE3. But there are many mortgages with broken titles and improper paperwork. QE3 allows the Fed to fix the broken chain of custody. Well, that’s just wonderful – paging Paul Volcker. He knew what to do with the distressed inventory of all of the failed S &L’s – get them off the books ASAP. Well, here we are again except instead of being the enablers with the cheap money, they are now the buyers. But I bet the end result will still be the same. They will get out when the getting is good and leave the mess behind them. It isn’t easy to buy stolen property when competing with people who get to buy it first with money they stole from me. Joe you, like me, can’t do a damn thing about it. The only option is to wait about three more years and save all the money you can so when it all comes apart and interest rates double down from current levels so prices drop. We have been priced out. What a manipulated market! Things will not end well is what history teaches us when market forces are flummoxed by manipulators. Anyone who has lived through “price controls” (or similar such as interest rate controls) can tell you what happens when market forces kick in again. Flippers and speculators are having a hayday! I feel sorry for their victims. I love living in my house for free. I asked them, in writing, to verify and validate the debt. Many, many letters later they still could not, under the law. I asked them to foreclose on me so we would then see the real “standing party” or alleged Plaintiff. They filed the foreclosure complaint. I filed a motion for dismissal based on the fraudulent note and assignment in answer to their foreclosure complaint. TA-DA! No answer, no motion on the banks part. So I love the incompetence of the banks. This worked because I did the QUALIFED WRITTEN REQUEST and kept insisting they were not verifying the debt, there weren’t, and asked them over and over to “prove it”. This gave me the information I used against them in my motion for dismissal based on their fraudulent submission to the court. Got it? IF they refile, the question is “are you lying about these new docs or were you lying about the old docs submitted in the case you let die”? See? May I ask you what the circumstances are that lead you to living in your house for free? I just love answering this question from people who still don’t get it! Why am I “living in my house for free”? Let’s see, in December 2007 when I was current on my mortgage, my loan servicer screwed up my account. I called GMAC Mortgage, and they failed to correct the problem. In January 2008 when GMAC declared my account in default claiming that I was 34-days late on my payment, I again attempted to work with GMAC Mortgage, but they claimed they didn’t know me and refused to work with me. In February 2008 when they sent me a Debt Validation Notice claiming that I owed a debt to Mortgage Electronic Registration Systems on a note dated December 23, 2005 I said “AHA. There’s the problem. I signed my note in May 2006 with WMC Mortgage Company” So I tried to work with them. What did they do? They declared default. Then a few days later, they returned my payments that was sitting in their account. So what did I do? I tried to work with them! Yes, I did. I tried a forbearance agreement. The main sticking point was my refusal to admit default. I wouldn’t do it. I insisted that they admit to their screw-ups. They refused. So I sued them. After the fact they alleged that I couldn’t pay, but my robust bank statements told a different story. Five years later I am still fighting for my home. I’ve survived Bank of America and their fraud. They sold my home on September 24, 2012, I sued them on September 27, 2012, and I had my home back on October 4, 2012. Yeah, I did. So what happened next? U.S. Bank eight SWAT officers to my home, and these officers posted a “Notice of Trustee” sign to my door, at gunpoint. So I sued U.S Bank. I got a restraining order against them. I got a Preliminary Injunction against them. I charged their lawyers with several crimes and got a California judge to agree to set a trial for the civil portion, as well as started working with state officials to bring criminal charges. What did they do? One day after Chris Dorner went on his killing spree, their lawyers went to a small courthouse with limited e-filing capability and accused me and my husband of being “angry Blacks” and got a restraining order against us. They failed to inform us of the TRO. They failed to inform us of the hearing. I found out anyway. Five out of five judges side with me, yet they are still trying to sell my home next week. After all is said and done, I now have a copy of the loan I signed on June 1, 2006 — the loan I was always willing to pay. Unfortunately for them, they fought me for 60+ months trying to enforce a December 23, 2005 note and the Statute of Limitations has expired to enforce any note. Given that ALL of this could have been avoided back in Jan 2008 if they had said “You are right. You did sign your note in 2006,” WHY SHOULD I PAY THEM A DIME NOW? They owe me for five years of abuse. Does that help clear your muddled brain? Yikes Karen. That’s awful. When I asked that question I wasn’t being antagonistic. I’ve heard of many different scenarios where each party is or can be at fault. It’s an awful situation with the market right now and you have been dealt with unfairly to the nines. It’s criminal. I’m a new Dad with a 4 month and trying to purchase my first home and can’t. I’m frustrated with the Fed, the banks, the investors/flippers the RE landscape and all the people that over reached as well. We have saved up just over a 100k and live in the Studio City/North Hollywood area. We want a home with long term appreciation because we will stay in it. We want a home. I wish you the absolute best in your fight and hope the perpetrators in your situation rot. you could start a business helping other people keep their overmortgaged homes for free. Charge a commission, this could be very, very, big. With rising property prices, all pay higher property taxes. CA just increased the sales tax 1/2 %. All workers had FICA go up 2%. I just checked “GasBuddy” for Van Nuys. The lowest price i see is $4.15/gal. Will retiring baby boomers and others now say, “We missed the last price bubble, let’s not miss this one.” What’s next? Something has to give. “Welcome to the unintended consequences of massive market intervention.” Keeping inventories artificially low is exactly what the Fed, in collusion with the banks, wants to happen. Just like they manipulated the market on the way up flooding the market with unqualified “homeowners”, they are now limiting the offer to push prices higher. Bernanke is merely a handmaiden for the big boys. Oh boy. People camping out, trying to “snag their dream homes”. Here in the central valley of California I have noticed a large number of long term vacant homes. Nothing is happening with them their just sitting vacant many for two years or more already. But also several of the homes that were bought up by investors and put up for rent have gone unoccupied for several months due to the fact that their asking too much for the rent. But I think also less people are losing their homes to foreclosure and rental properties are staying vacant. We’re in OC and have been looking at rentals. All but one have been vacant. A few have been on the market for 3 or 4 months. Have been told by agents that the owners are waiting for applicants with good credit. Husband looked at one yesterday in a good neighbourhood but the house was a complete dump. Asking premium rent. Apparently the owners are dentists who inherited the house and will not upgrade or fix anything. Husband said the place was putrid and kitchen etc original. Owners have rejected many applications due to poor credit and lowballing. We have great credit and wouldn’t rent it even if it was $1500 month less. Don’t know who will ever rent it. Owners seemingly will wait forever for someone to pay their asking. Has been on the market for many months. Also encountering owners how will not get back to agents, taking a week to get back to them about simple questions. We asked one if they would repaint the house (they have just bought it with cash and was a foreclosure). They said they would do the downstairs only. Would not do the upstairs or the bannister. Problem is that is where all the drawings and scribbles are. There are massive amounts of pen scribbles all over the bannister and huge faces on one of the bedroom walls. All I hear is ‘stick it scum’, not the kind of relationship we’re looking for with a landlord. It’s all getting demoralizing really. I have seen a lot of this up in the SF Bay Area (where I currently live despite my moniker). Empty properties with unrealistic rents. Bad condition, bad neighborhood, lack of transportation/services access charging double, triple what a fair rental price would be. I guess landlords don’t want to be locked in long-term to what they feel are “low” rents since they feel the employment situation & economy will pick up any day now. Just got a new place up here that is live/work zoned and month to month lease at a comfortable rent with some utilities included – feels great to only have to give 30 days notice and be gone if I want. It was hard to find because most rentals up here are at least $2K/month – feels weird to pay that much. A lot of the other places I looked at were asking for $1700-$2K/month in bad neighborhoods with verifiable net income of 3X rent. I don’t know too many people living in the ghetto with net income of $6K but apparently these landlords have the expectation that there are. I’ve seen enough in CA after 31 years. Sold my home and will close the end of the month. Destination Idaho. I sold in 7 days, standard sale. I had 12 views and 6 offers and took the one $ 7k over asking. Buyer is 100% VA with $20k cash over appraisal. Anyway, while interviewing 2 of the major moving companies for bids, I asked if their outgoings are outpacing their incomings. Both said the CA outgoings the past 2 months are the talk of the moving industry ! It can’t just be me who knows the tax man will be coming with a vengeance. Can’t do anything about Obama, but I can sure do something about Jerry Brown and his public union thugs. I’ll snowbird out of Idaho in the winter, but not to CA. I feel sorry for my CA friends who are also fed up, but cannot leave due to family reasons. You sounded pretty reasonable until you called working people thugs. The destruction of our economy began with Enron, a corporation committing fraud against the state of California, continued with Bush II’s unfunded wars and finished up with banks conning the govt out of regulating them. It is a fact that America’s most prosperous period coincided with the greatest number of union jobs. i have reviewed a few graphs showing short sales rising as forclosures falling. I believe that the forclosure numbers are falling as the values rise, the note holders are reaching thier net shorts with overbidding and estimated values running upwards of 10-30%. remember you cant have a supply issue without demand. if demand is minlipulated the values are faux. do not be fooled. The Homeowner’s Bill of Rights (HOBR) is just another stall tactic to draw out foreclosure. Politicians are actually doing a disservice to borrowers in foreclosure by passing this legislation. 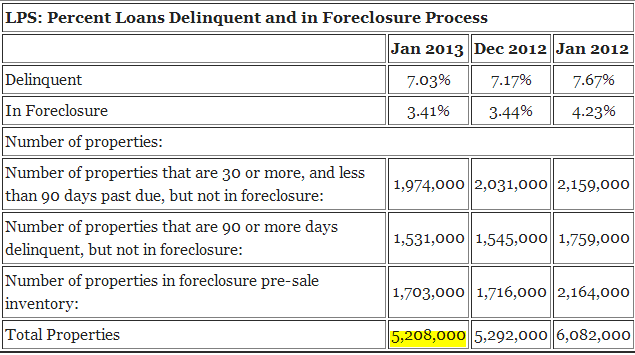 Many states that are pro-borrower are changing their foreclosure process from non-judicial to judicial. 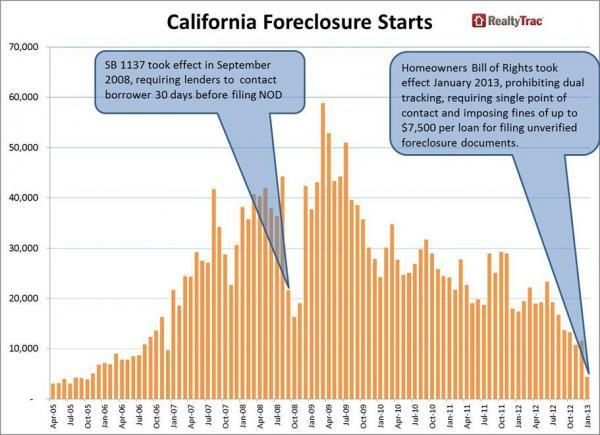 While California is a mostly non-judicial state, we will see an increase in judicial foreclosures due to HOBR. I think this is just another way to transfer wealth from the middle class and poor to the uber rich. Is that what the past what the past 30 years has been all about. Historically one of the ways the middle class could save for retirement was paying off a mortgage along with appreciation on their homes. Incomes are down nationwide I left CA in 2006 and returned in 2011 thinking I could buy a place as housing falls. It soon became apparent that I was wrong. Tons of evidently bogus listings dwindled to nothing and rentals were so high it was beyond my fixed income. So I moved again to Portland. After six months I caved in a bought a new condo. I know I paid too much and will probably watch the value go down but I desperately needed a place to take advantage of the low interest rates (that when up while I was looking). I notice that many of the RE agents here are being told lies or are telling me lies. When it comes to money no one tells the truth. The US housing market is a huge mess with the money going to Wall Street and other countries. It’s the same old story – the rich get richer and the rest of us – well you know. I will say it is a great deal more pleasant in Portland than CA. Public transportation is quite good. The people are quite friendly, the weather is not as bad as I expected. And Number One reason – no one talks about movies here – evidently the celebrity worship of Southern CA has not caught on here – yet. I don’t know how long it will take to return the housing market to normal conditions. Probably never. This has just been so profitable to the banks and the uber rich for them to give it up. Wife and I have been looking for a house in La Canada Flintridge for the last 6 months. We were out bid by investors on two occasions. We’re still looking. But the sad reality is that since February, many new listings are asking above their 2006/2007 purchase prices. Are you kidding me? 1 year into the “recovery” we’re exceeding the last bubble highs? It’s insane. One good thing, maybe, this will force more inventories on the market due to less under water owners. Bad news is that if you miss one or two buying opportunities like we did, you may find yourself quickly priced out. Still paying $1/square foot/month in my rent controlled Warner Center apartment. Still avoiding purchasing a home because the government is artifically propping up the real estate prices. Saving up every penny. Hard to say where to put it. Real estate is too risky due to rampant market interventions. Stock market is very risky due to high frequency trading and the impact of Obamacare on individuals and companies. I got a promo from my stock trading company talking about which bonds are the best bet. Maybe that’s a clue that it is getting close to time to short the bond market. That will certainly change things in this country. Where are you people putting your money? I am all out of ideas. Why did this home jump 50% in 2 months? From 400 to 600k was this a foreclosure I could have bought in December for 400k? Wecome to the Fascist States of Amerika! This is the new normal, the one that everyone voted for. You love it don’t you! Wow, this article really hit home as I am newly and currently a Florida resident for the time being. I can attest to the fact that the number of foreclosures and short-sales hitting the market here is unreal. Having just recently purchased a home here, I can also confirm that ‘all-cash buyers’ can swoop in and take a house of the market within literally five minutes of it being listed. This happened several times to us. I’m talking first-hand experience unfortunately. Money is cheap, as was stated here, and those with money are taking advantage of it. Who wouldn’t, right? I too feel for the families in Florida and California not to mention all over the country facing these issues. Is the current climate setup for this to happen again? Let’s hope not. It is a great time to buy for new home owners and first time home buyers. I also agree with Kymmie that the number of short-sales and foreclosures is insane right now. This needs to be widely distributed. This is a webinar put together to assist resistance to the bankster frauds in seizing properties, when they have no legal basis to do so due to the securitization process which includes MERS the Mortgage Electronic Records Service which violated contract law at the outset and then enabled the robo-signer scamming of the process. Over the past couple of years, I’ve tried to explain how the financial sector created MERS to destroy property records so that it would be easier to steal homes. In the old days, property records were maintained at county recorder offices. But that was so old-school. It made it too easy to find out who owes whom and who owns what. Wall Street wanted to make this as complicated as possible so that no indebted homeowner would ever know who she/he owes. Wall Street took the mortgages and sliced and diced them, separating origination of mortgages from the ownership of the right to receive payment, and as well separated that ownership from the servicing of the mortgages. And then the bankers burned all the records. In the old days, you had to keep all the documents together, in physical form. And when a mortgage was sold, you had to go back to the recorder’s office to change the record. With the creation of MERS, most of those documents were destroyed and the banksters never bothered to tell the recorders who owned what. The indebted households have no idea who owns their note and who services the mortgages. Even if they write that monthly check, the banks claim they never received it—the dog ate it, you know. It will take decades to sort out the mess that MERS has made of property records. Meanwhile, don’t believe ‘em. They have no proof they’ve got a right to take your home from you. Why Are You Still Be Duped Into Paying For Forensic Audits? “The defendants behind an operation that allegedly preyed on vulnerable homeowners have agreed to settle Federal Trade Commission charges that they lured people into paying $1,995 or more by holding out bogus promises that they could help them avoid foreclosure and renegotiate their mortgages. The settlement also imposes a $3.5 million judgment, which reflects the full amount of consumer injury during the two years before the operation was shut down. The judgment will be suspended due to the defendants’ inability to pay. If it is later determined that the financial information the defendants provided to the FTC was false, the full amount of the judgment will become due. DO NOT PLEAD A LAUNDRY LIST. The vast majority of these affirmative defenses will not apply to any given case–they are intended as a brainstorming tool, and certainly should not be included in full. Rule 11 requires that you have a good faith basis for believing an affirmative defense actually applies before pleading it, and in discovery you will likely need to respond to an interrogatory identifying all factual bases for every affirmative defense you plead.